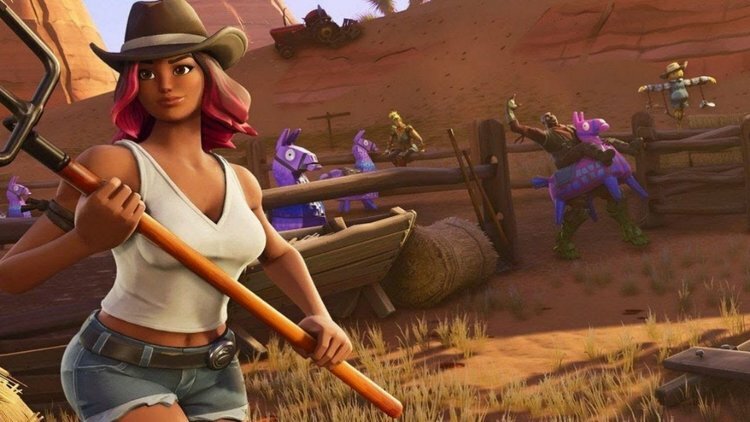 Fortnite‘s 6.30 content update brought the new Limited Time Mode Wild West. As game developer Epic Games describes this Duos game mode, “no fancy tech here, partner!” Players don’t have access to items that wouldn’t exist in the American Old West on the 19th century. That means most automatic weapons, sniper rifles, and all launchers are disabled in Wild West. The only guns players and their ally can use are the Hunting Rifle, Pump Shotgun, Double Barrel Shotgun, Six Shooter, and the Minigun. Players have item restrictions. They can heal themselves with Bandages, Medical Kits, and Campfires, but the only way to get shield from items is from Slurp Juices found in Supply Drops. Mushrooms are still spread around the map and grant five shield each. Supply Drops can also carry epic Six Shooters and legendary Double Barrel Shotguns or Miniguns. These are the items of highest rarity available in the game mode, but that doesn’t mean they’ll be the best. The new explosive item Dynamite is debuting in Wild West. With its huge 800 damage to structures, players will probably have a hard time staying on their structures for long. Glider re-deploy is enabled, so having your building destroyed in Wild West won’t be the worst thing that can happen to you in the mode. Wild West will probably have a lot of close-quarters combat since most of the weapons available are horrible at distance. Players without a Hunting Rifle will be forced to approach their enemies aggressively to take advantage of shotguns. As in every Limited Time Mode, players can join Wild West to complete challenges of their season six Battle Pass. Wild West is already available for all Fortnite: Battle Royale players.